Velvet loafers a.k.a. Albert Slippers —we'll explain the name in a little bit— have always been reserved for royalty, celebrities or for those watchlifestylers with enough panache to sport them outside their homes or their cigar smoking lounges. The history behind the velvet loafers a.k.a Albert Slippers tells us that they were originally created to be used as an indoor type of shoe with a velvet upper often embroidered with a royal crest and fitted with leather soles. Back during Victorian times in England, regal men would replace their shoes at the front entrance with Albert slippers to avoid dragging dirt, gravel or sand into the finely finished hardwood floors of their homes. The name Albert comes from Prince Albert —Queen Victoria's husband who made them popular. In this day and age, velvet loafers had turned into a statement type of shoe, more than just being an elegant men's slipper destined to be worn indoors. Commonly worn outside the house with a tuxedo or a velvet smoking jacket, the velvet loafer has now become quite popular among watchlifestylers on Instagram and is now a proper shoe that can also be worn in a casual way outside the house. Now, if you have the panache to wear this elegant Alberto Moretti Arfango No.1 velvet loafers —like we did during Baselworld 2015—, you are definitely a watchlifestyler that has all that it takes to sport a Manufacture Contemporaine du Temps MCT Sequential Two S200 with perfect matching blue numerals. For those of you not familiar with Alberto Moretti, let's now talk about the man behind this phenomenal No. 1 velvet loafers. Alberto Moretti is part of the Moretti family from Tuscany, who's been involved in the shoe business for several generations making shoes for Gucci, Prada and even Church's. 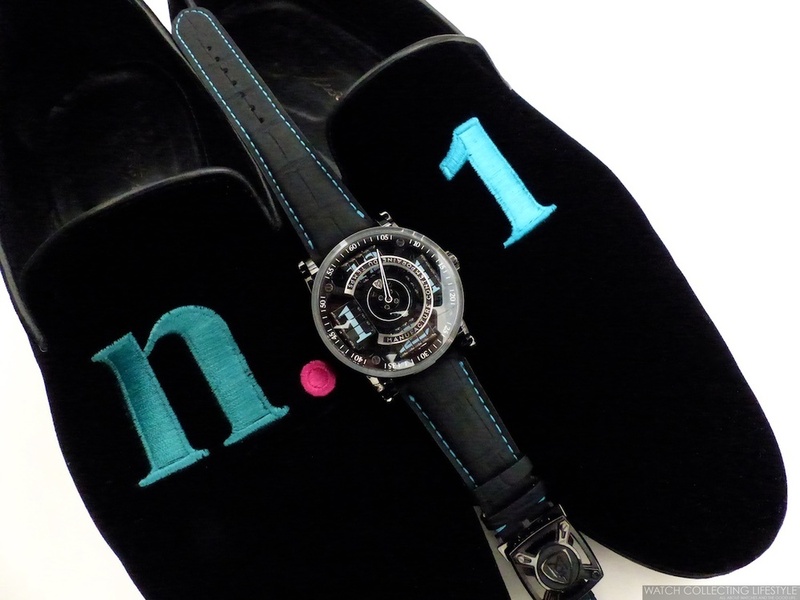 Alberto is very well known for his velvet loafers and for his stilettos fitted with gold heels that sell for close to $5K at an exclusive shoe store in Dubai, however, his expertise mainly comes from being the mastermind behind Prada's Car Shoe brand and a regular contributor for Italia Independent —by the way check the Hublot Italia Independent we featured here. The Alberto Moretti No. 1 velvet loafers not only feature the traditional Albert Slipper design in shape and form, but also in terms of padding —minus the quilted pattern—, their immaculate embroidery on the upper and its finest leather soles. If you've been to Saint Tropez lately, then you are familiar with the Arfango by Alberto Moretti boutique on the upscale Rue Gambetta. This exclusive boutique with plush red velvet seats is as captivating as the Vilebrequin boutique just a few doors down. The craftsmanship and comfort of this velvet loafers explains why they are the brand of choice for Prince Harry and American actor Adrien Brody. Alberto Moretti Arfango velvet loafers in the U.S. are exclusively sold at Barneys New York but you might occasionally also find them at small luxury boutiques throughout the country. If you are traveling to Milan, make sure to stop by his showroom in Via della Spiga. The Alberto Moretti Arfango velvet loafers are extremely comfortable and designed in the perfect width to accommodate feet of different widths. Opposed to many other velvet loafers from brands like Church's, Bowhill & Elliot or Crocket & Jones, the Arfango by Alberto Moretti have perfect instep design suited for men with a high instep. If you are ready to make a statement or just want to look up to par with other watchlifestylers in your watch collecting circle, this loafers are the best you can get. Best when paired with an elegant Tom Ford velvet smoking jacket and a festive matching shirt. Sticker Price $850 USD. For more info on Alberto Moretti click here and for MCT watches here. Posted on April 24, 2015 by Editor & Publisher and filed under MCT, Fashion & Style and tagged Alberto Moretti Manufacture Contemporaine du Temps Sequential Two MCT Sequential Two S200 Velvet Loafer No. 1 Alberto Moretti Velvet Loafers Alberto Moretti Arfango Arfango Velvet Loafers Top Fashion.